THE SMURFS 1980 Production cel of the Smurfs presented on its key master background. THE SMURFS 1980 Production Cel of the Two Smurfs Dressed as Puppets. Presented on a Color Laser Background. THE SMURFS 1980 Studio Print (Xerox) Model Sheet of Azrael, Gargamel and Smurf. 3 Images. 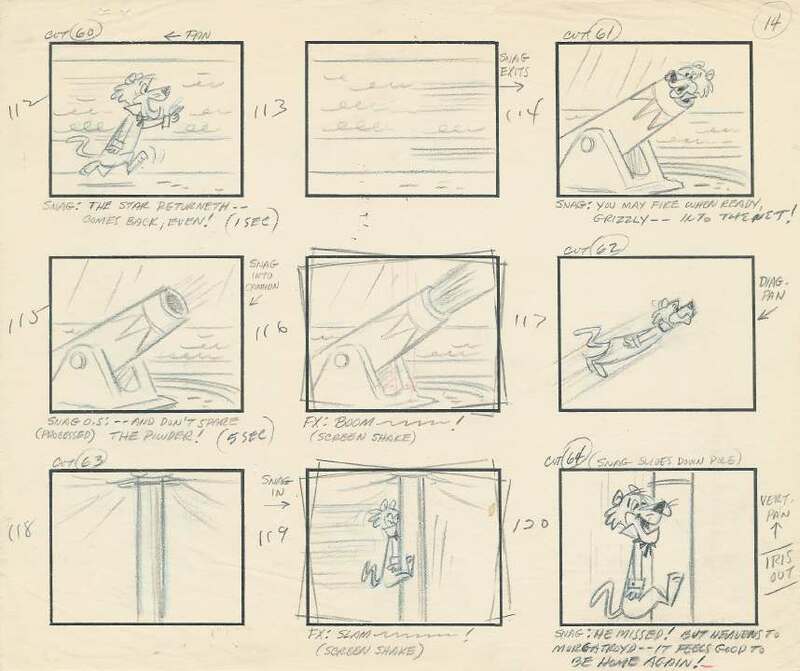 SNAGGLEPUSS 1961 9 storyboards from an early Snagglepuss Cartoon entitled “Jangled Jungle”. Page 1. SNAGGLEPUSS 1961 9 storyboards from an early Snagglepuss Cartoon entitled “Jangled Jungle”. Page 11. 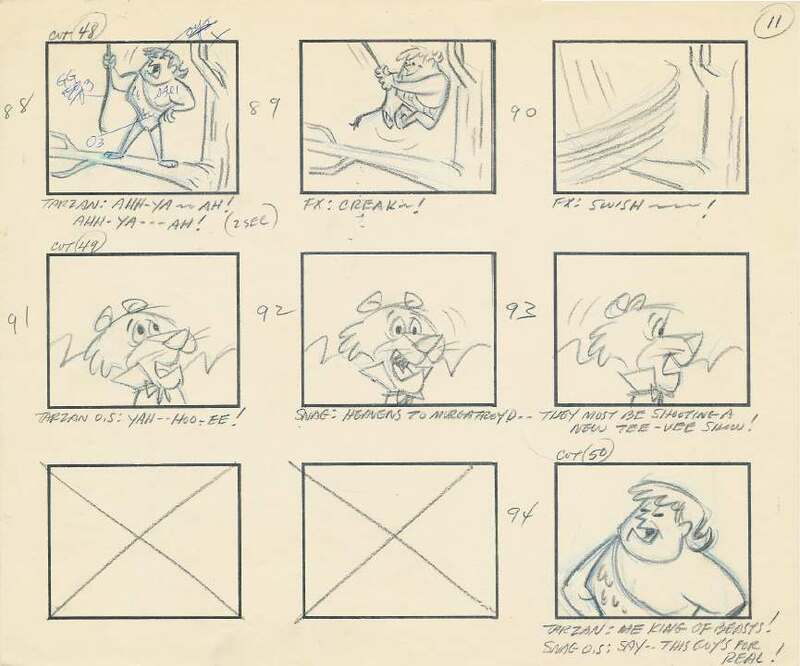 SNAGGLEPUSS 1961 9 storyboards from an early Snagglepuss Cartoon entitled “Jangled Jungle”. Page 12. 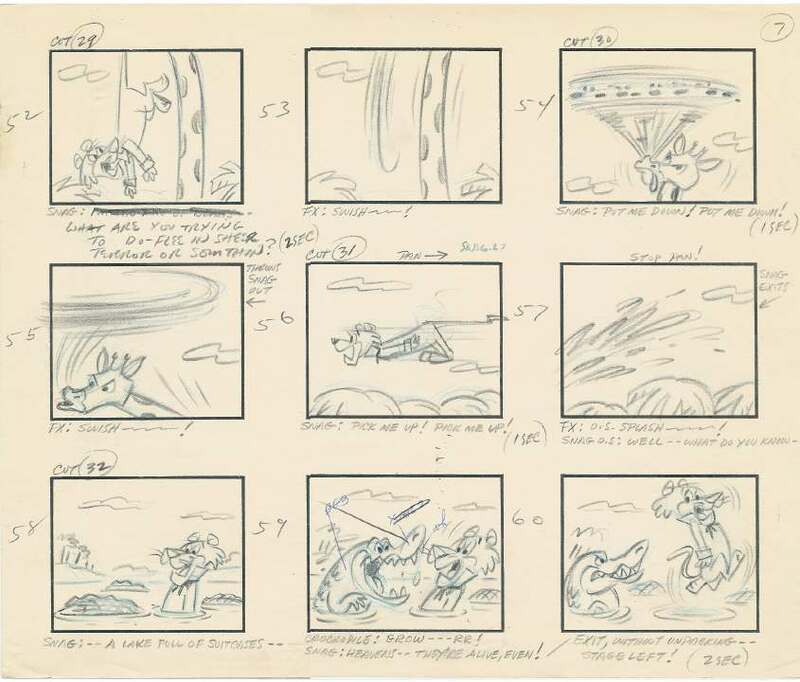 SNAGGLEPUSS 1961 9 storyboards from an early Snagglepuss Cartoon entitled “Jangled Jungle”. Page 13. SNAGGLEPUSS 1961 9 storyboards from an early Snagglepuss Cartoon entitled “Jangled Jungle”. Page 14. 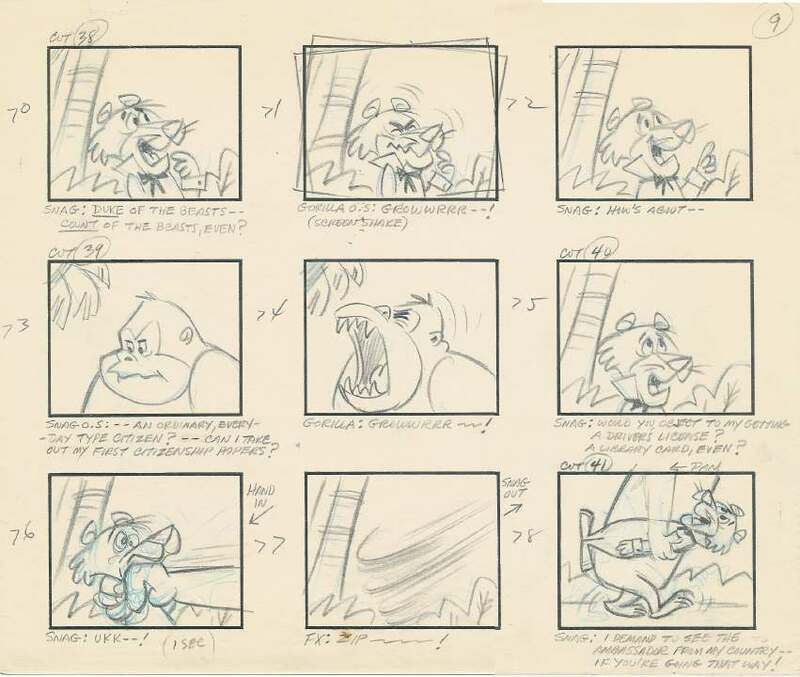 SNAGGLEPUSS 1961 9 storyboards from an early Snagglepuss Cartoon entitled “Jangled Jungle”. Page 3. 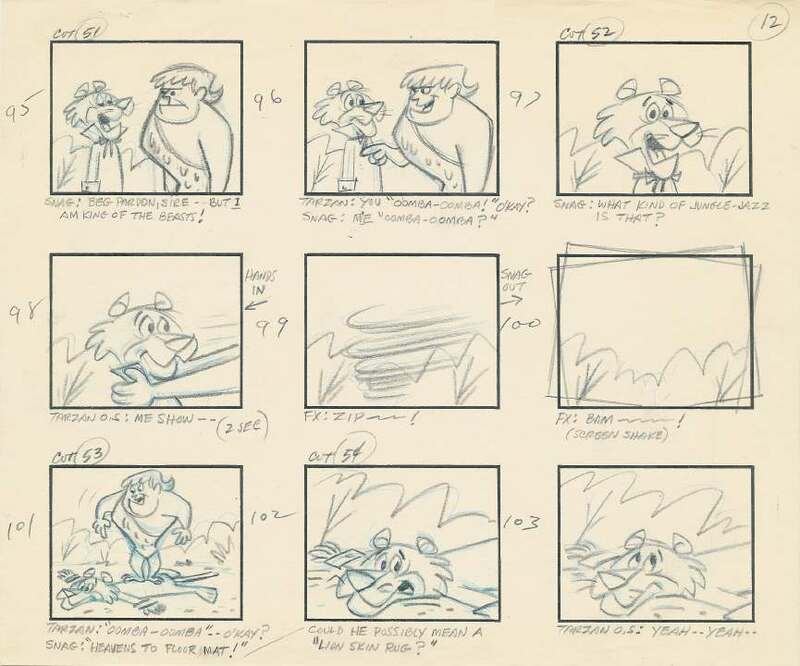 SNAGGLEPUSS 1961 9 storyboards from an early Snagglepuss Cartoon entitled “Jangled Jungle”. Page 5. 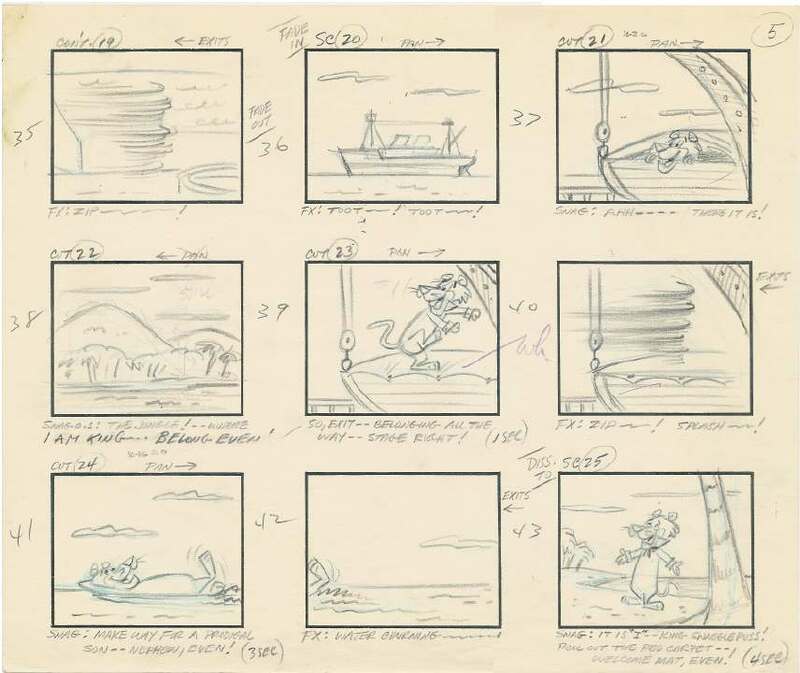 SNAGGLEPUSS 1961 9 storyboards from an early Snagglepuss Cartoon entitled “Jangled Jungle”. Page 6. 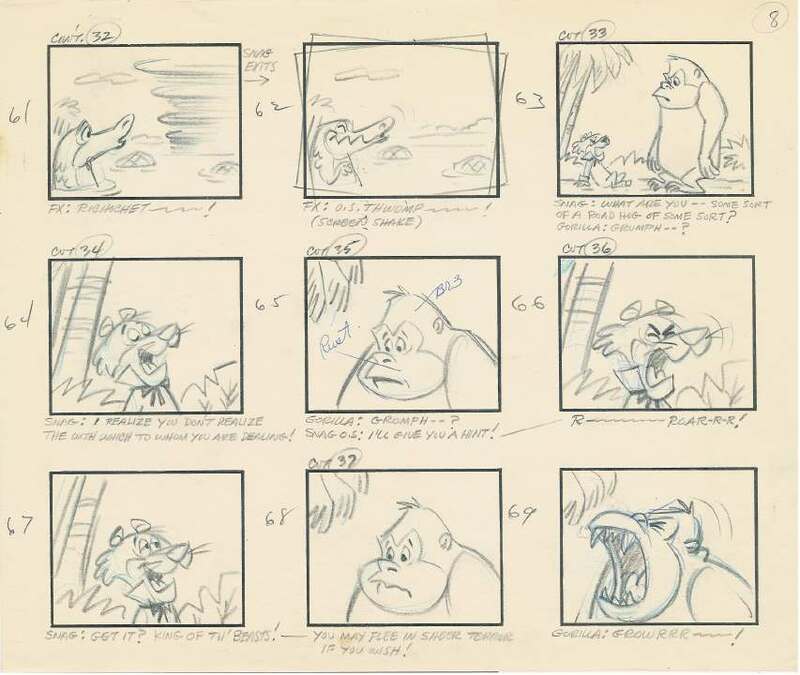 SNAGGLEPUSS 1961 9 storyboards from an early Snagglepuss Cartoon entitled “Jangled Jungle”. Page 7. SNAGGLEPUSS 1961 9 storyboards from an early Snagglepuss Cartoon entitled “Jangled Jungle”. Page 8. 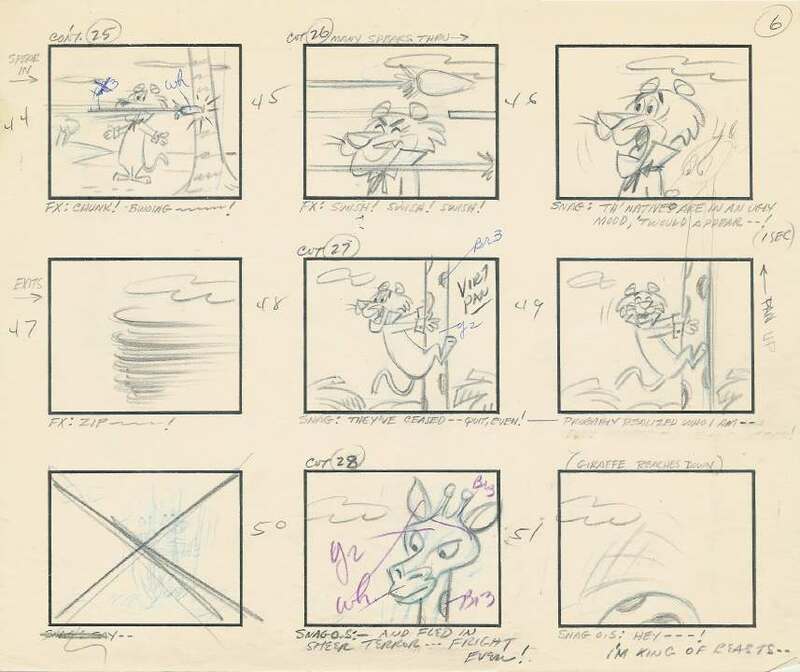 SNAGGLEPUSS 1961 9 storyboards from an early Snagglepuss Cartoon entitled “Jangled Jungle”. Page 9. SNAGGLEPUSS 1977 Studio Print (Xerox) Model Sheet of Snagglepuss. 2 Images. Slight Tear in Upper Left Corner. SNAGGLEPUSS 1977 Studio Print (Xerox) Model Sheet of Snagglepuss. 8 Images. SNOOPER & BLABBER 1977 Studio Print (Xerox) Model Sheet of Snooper & Blabber. 11 Images. SNOOPER & BLABBER 1977 Studio Print (Xerox) Model Sheet of Snooper & Blabber. 3 Images. SNOOPER & BLABBER 1977 Studio Print (Xerox) Model Sheet of Snooper & Blabber. 4 Images. WALLY GATOR 1960’s Animation Drawing of Wally with Cel Painting Instructions. WALLY GATOR 1977 Studio Print (Xerox) Model Sheet of Wally Gator. 2 Images. WALLY GATOR 1977 Studio Print (Xerox) Model Sheet of Wally Gator. 4 Images. YAKKY DOODLE 1977 Studio Print (Xerox) Model Sheet of Yakky Doodle. 2 Images. YOGI AND BOO BOO BEAR 1977 Studio Print (Xerox) Model Sheet of Yogi Bear & Boo-Boo. 13 Images. YOGI BEAR 1960s 9 storyboards from an early Yogi Bear Cartoon entitled “Beast Feast”. This cartoon was a spoof on the Beauty and the Beast story. Page 1. YOGI BEAR 1960s 9 storyboards from an early Yogi Bear Cartoon entitled “Beast Feast”. This cartoon was a spoof on the Beauty and the Beast story. Page 2. YOGI BEAR 1960s 9 storyboards from an early Yogi Bear Cartoon entitled “Beast Feast”. This cartoon was a spoof on the Beauty and the Beast story. Page 3. YOGI BEAR 1960s 9 storyboards from an early Yogi Bear Cartoon entitled “Beast Feast”. This cartoon was a spoof on the Beauty and the Beast story. Page 5. YOGI BEAR 1960s 9 storyboards from an early Yogi Bear Cartoon entitled “Beast Feast”. This cartoon was a spoof on the Beauty and the Beast story. Page 6. YOGI BEAR 1960s 9 storyboards from an early Yogi Bear Cartoon entitled “Beast Feast”. This cartoon was a spoof on the Beauty and the Beast story. Page 7. YOGI BEAR 1960s 9 storyboards from an early Yogi Bear Cartoon entitled “Beast Feast”. This cartoon was a spoof on the Beauty and the Beast story. Page 8. YOGI BEAR 1960s 9 storyboards from an early Yogi Bear Cartoon entitled “Beast Feast”. This cartoon was a spoof on the Beauty and the Beast story. Page 9. YOGI BEAR 1960s 9 storyboards from an early Yogi Bear Cartoon entitled “Beast Feast”. This cartoon was a spoof on the Beauty and the Beast story. Page 10. YOGI BEAR 1960s 9 storyboards from an early Yogi Bear Cartoon entitled “Beast Feast”. This cartoon was a spoof on the Beauty and the Beast story. Page 11. YOGI BEAR 1960s 9 storyboards from an early Yogi Bear Cartoon entitled “Beast Feast”. This cartoon was a spoof on the Beauty and the Beast story. Page 12. YOGI BEAR 1960s 9 storyboards from an early Yogi Bear Cartoon entitled “Beast Feast”. This cartoon was a spoof on the Beauty and the Beast story. Page 13. YOGI BEAR 1970’s Animation Drawing of Yogi Bear. Ref. #B-11. YOGI BEAR 1970’s Animation Drawing of Yogi Bear. Ref. #B-13. YOGI BEAR 1970’s Animation Drawing of Yogi Bear. Ref. #B-14. YOGI BEAR 1970’s Animation Drawing of Yogi Bear. Ref. #B-6. YOGI FOR RANGER 1992 Hand-Painted Limited Edition of "Yogi For Ranger" Signed by Bill Hanna and Joe Barbera. #123/400. Hanna-Barbera COA on back. YOGI BEAR 1980s Production cel of Yogi Bear and Ranger Smith signed by Bill Hanna and Joe Barbera. YOGI BEAR 1970’s Animation Drawing of Yogi Bear. Ref. #B-7. YOGI BEAR 1970’s Animation Drawing of Yogi Bear. Ref. #B-8. YOGI BEAR 1970’s Animation Drawing of Yogi Bear. Ref. #B-9. 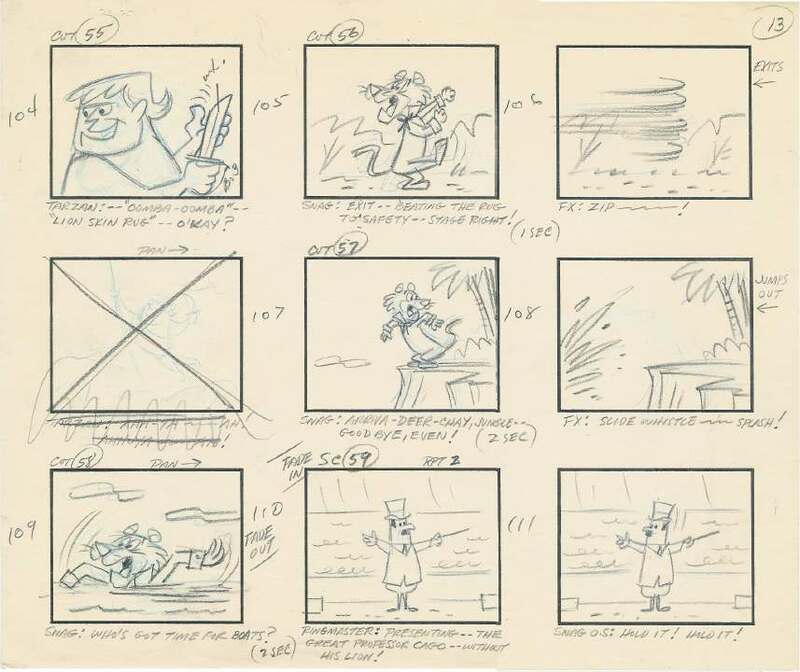 YOGI BEAR 1960 Nine Storyboards for a Yogi Bear Cartoon. Production #R-32, Page #13. 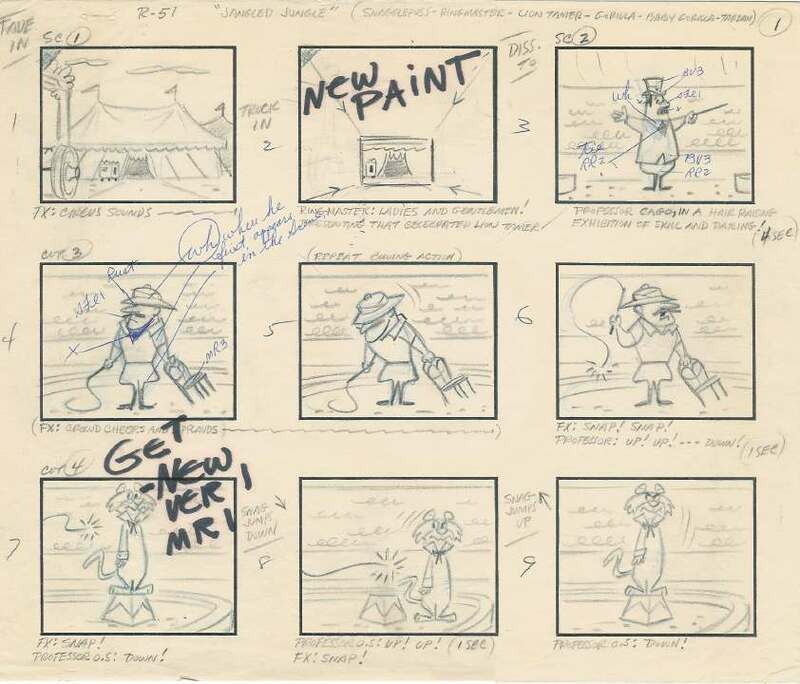 YOGI BEAR 1960 Nine Storyboards for a Yogi Bear Cartoon. Production #R-32, Page #14. 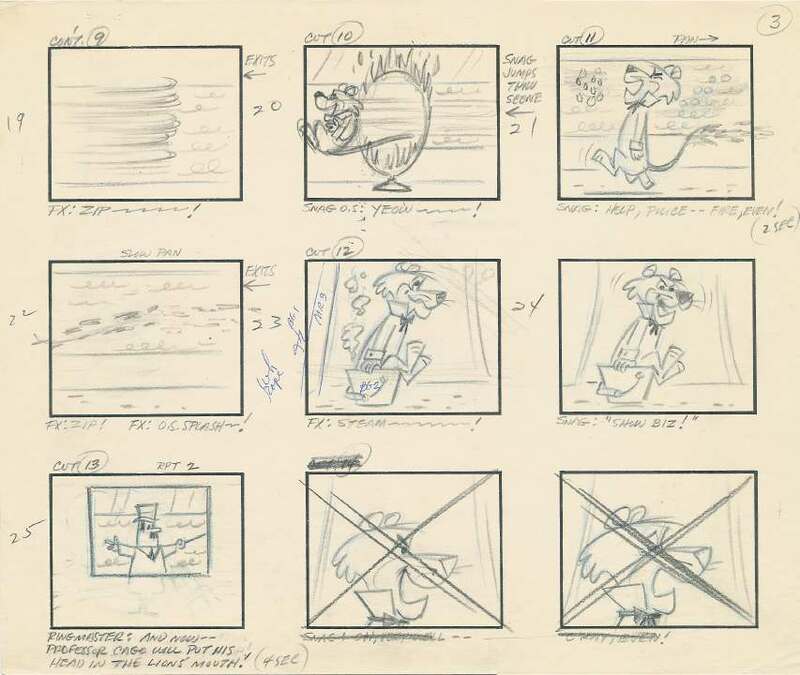 YOGI BEAR 1960 Nine Storyboards for a Yogi Bear Cartoon. Production #R-32, Page #7. YOGI BEAR 1980’s Production Cel of Yogi Bear Presented on a Hand-Prepared Watercolor Background. YOGI BEAR 1977 Studio Print (Xerox) Model Sheet of Yogi Bear. 6 Images. YOGI BEAR 1977 Studio Print (Xerox) Model Sheet of Yogi Bear. 9 Images.